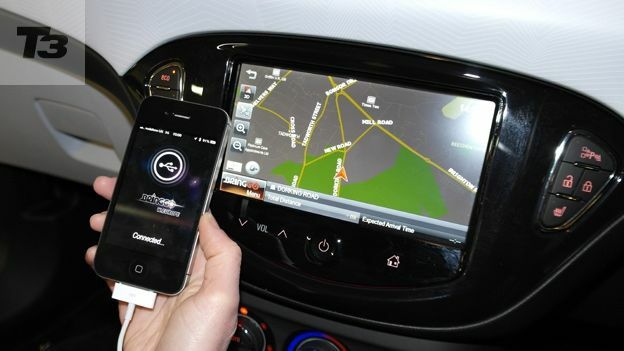 Vauxhall will launch a new iPhone 5 and Android sat nav app called BringGo which when launched can be used as either a personal mapping service on the go or, when connected to the upcoming Vauxhall ADAM, can become the sat nav for the car. The app is part of a suite of apps which Vauxhall will release for its IntelliLink in-car media centre. Using a 7-inch LCD display the iPhone connects to the system and can mirror these apps onto the larger screen giving you full sat nav along with access to the iPhone's photos, music and videos. With cars having a much longer shelf life than smartphones Vauxhall has created the IntelliLink system in order to keep their in-car media centres as up to date as the latest smartphones with updates to the apps happening on the smartphones themselves and updates to the system happening every time the car is serviced. Vauxhall has confirmed that they will be launching other apps that will be compatible with the Vauxhall ADAM including the Stitcher Radio app letting you play on-demand podcasts and radio stations. During the Paris Motor Show Vauxhall confirmed that the system would also be compatible with Android smartphones including the Samsung Galaxy S3 however there's been no further confirmation on this. Vauxhall is giving UK punters the chance to get hands-on with the new ADAM and its tech on The Street, Westfield Stratford from Saturday 16th for just over a week.